One of my favorite parts of the Leprechaun Chase 10K is, of course, the chase! The lads chase the lasses in an epic struggle for bragging rights and free beer. The Des Moines course is fast and flat with less than 20 feet elevation gain/loss over 6.2 miles. With race-time temps around 35 degrees and low winds, I knew we’d have some fast times. Also, I could see the lasses would have their work cut out for them. Past Leprechaun Chase winner, Ben Jaskowiak of Des Moines, was registered and also toeing the line was Brogan Austin from West Des Moines, the overall winner of Pink Gorilla’s 2017 Good Life Halfsy – Half Marathon in Lincoln, Nebraska. Not only were times fast, but Brogan Austin smashed a course record finishing with a 30:43 and breaking Tyler Jermann’s 2015 record. The overall lass winner was Elizabeth Starbuck from Glenwood, Iowa crossing the finish line in a speedy 38:44. Lads drink free beer in 2018 and extend their lead to 4 wins to 2 over the lasses. The Green Beer After Party is always swinging at El Bait Shop, but always a little more so when the sun is shining and the weather hinting at warmer days to come. It blows my mind to see some of the fun and creative costumes people come up with and run in every year. Irish flag capes, green beards, kilts and green wigs were heavily represented. I think it’s safe to say that nobody does St. Patrick’s Day shenanigans like Des Moines. 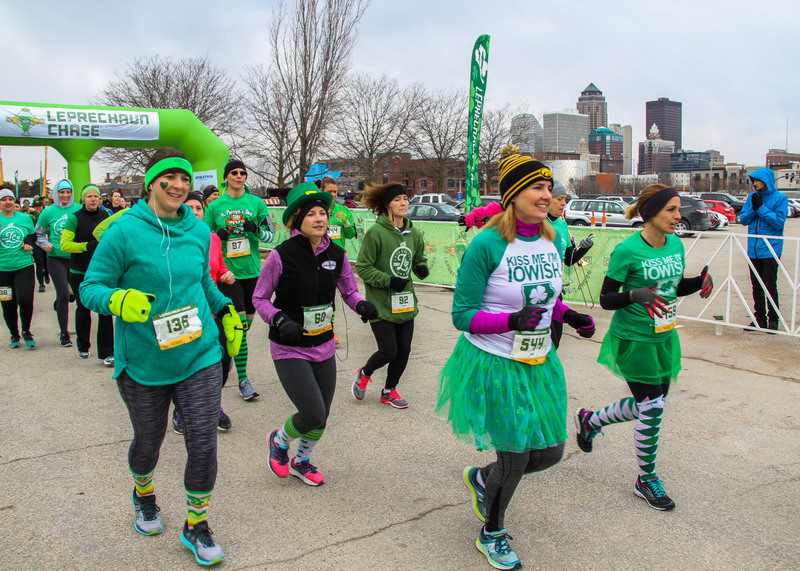 Leprechaun Chase 10K Des Moines wouldn’t be possible without the support of volunteers and we have some pretty incredible ones! For the past six years, we’ve partnered with the Animal Rescue League of Iowa as our charity partner. They’ve supported the race with volunteers, many of which have helped out every year. To date, we’ve been able to fundraise over $20,000 to support their mission of serving people and pets from across the state of Iowa through its many programs. Thanks, ARL! My high for the day was twofold. First, I’m not normally a morning person, but I love waking up early on race day, and seeing the sunrise over the golden dome of the Iowa State Capitol is always a beautiful site. Second, I have the rare pleasure to start most Pink Gorilla Events races by donning the pink gorilla costume and leading out the masses blasting my broken and out of tune high school trombone. For me, it’s the sound of race day and I love it! My race low is pretty funny, at least to me. I had a short break about an hour before the race and decided I would sneak away and get a coffee a couple blocks away. For speed, I took one of our pink scooters. Feeling generous, I picked up 3 other coffees for the crew. Blasting back to start line with 1 hand on the scooter and the other hand carrying four coffees in a to-go case was probably not the best idea. I was about to cross 2nd Street when the scooter hit a crack in the sidewalk. I sent the 4 coffees flying into 2nd Street and proceeded to stumble over the handle bears, rolling into the spilled coffee and lattes. It was quite the sight to see I’m sure for those that got to witness the race director sliding across the pavement through a coffee puddle. Unfortunately, our race photographer missed the moment by just a few seconds or I would have a pretty funny photo to share with you. Thanks again to all runners and volunteers for making the 2018 Leprechaun Chase fun and memorable. Next up on the Pink Gorilla Events calendar is the Market to Market Relay from Jefferson to Des Moines on May 12th. We hope to see your team there!